The Pennine Hills form a backbone to England extending north from Derbyshire to Tynedale in north-east England. The high ground and wild moorland continues through the Northumberland National Park to merge with the Cheviot Hills. Ramblers can follow the 267 miles of the Pennine Way from Edale in Derbyshire to Kirk Yetholm just across the English border with Scotland. 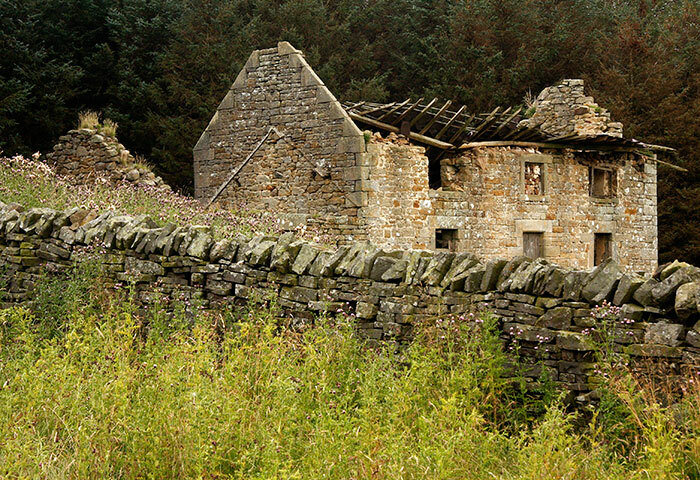 Sparsely populated, the Pennines once supported extensive lead mining, quarrying and associated rural industries: farming continues. 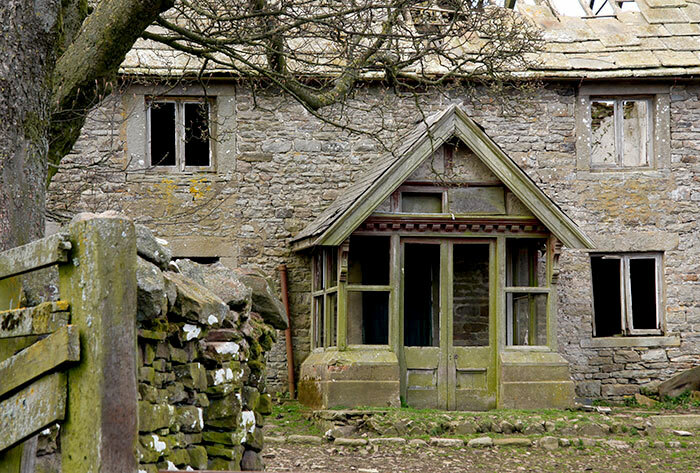 This gallery looks at four abandoned farmsteads following a theme of dereliction and decay. 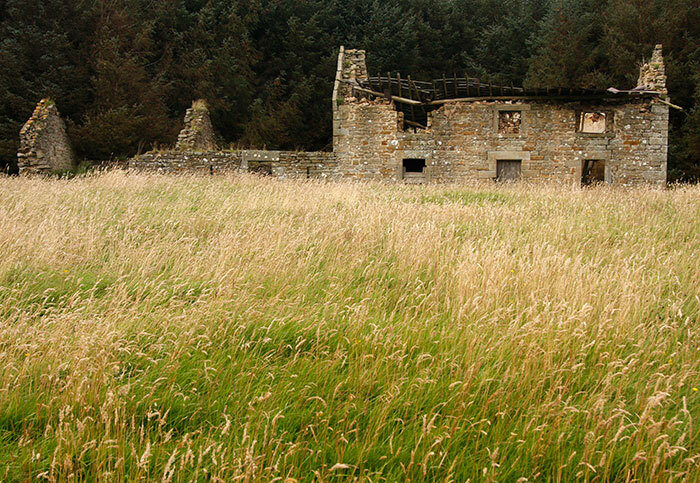 This simple linear farmhouse and working buildings face south, all backed by conifer woodland of later date. 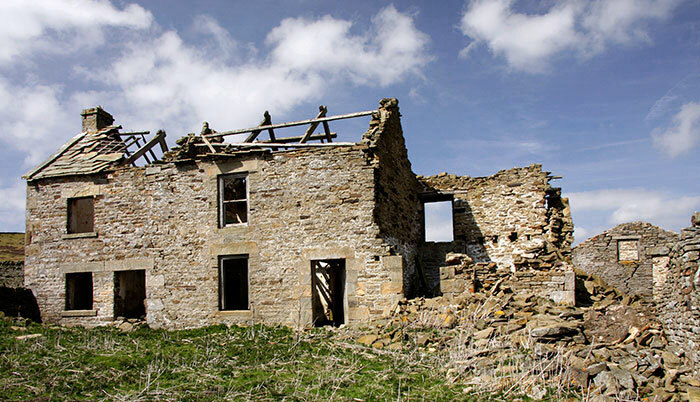 On a mapped footpath which had little physical presence on the ground it was an energetic walk over uneven and tussock strewn grass land to reach this picturesque ruin. The previous image was a first view over a drystone wall. This enclosed a rectangle of grass generous as a garden but small as a field: for this shot the camera rested on its second side. I was too concerned with framing the image to check the tree variety: hawthorn looks the most likely. In its heyday the family would have relied on a spring for their water, locally mined coal for heating and paraffin oil or candles for lighting. Sanitation would be of earth closet design. In spite of its current state the buildings were clearly of substantial construction. A range of single storey working buildings extended from the west gable of the house. From a distance the collapsed roof timbers resembles a splayed rib cage. They contrasted in form and tone with the blue-grey slates and the richly varied light-earth colours of the stonework. I looked into the interior where possible but ignored the temptation to enter and explore. Visually there was more to study outside including the farmstead’s setting in the landscape. 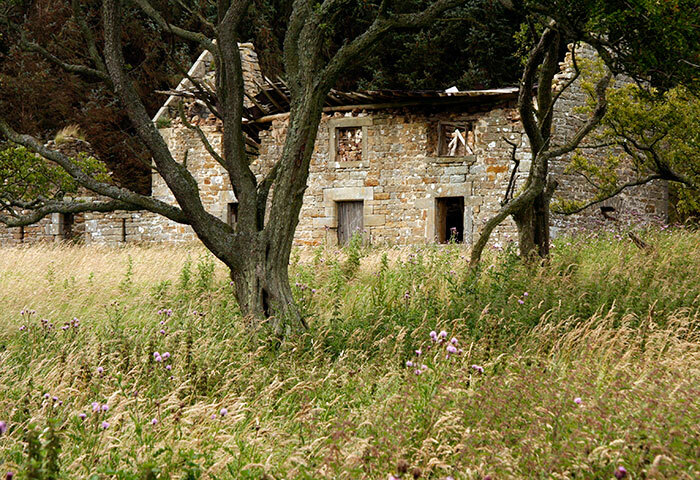 Barns and outbuildings may once have stood where trees are now ranked but no remnants are evident. There is a contrast in the carpentry within the roof structure. The long horizontal purlins are straight debarked tree trunks lightly cut to provide flats above and below whereas the rafters and slate battens are more precisely cut. Angled scarf joints used to join the heavy timber ends together have been pulled apart in the roof collapse. It’s a simple front door that may be a replacement for a more substantial and detailed original. 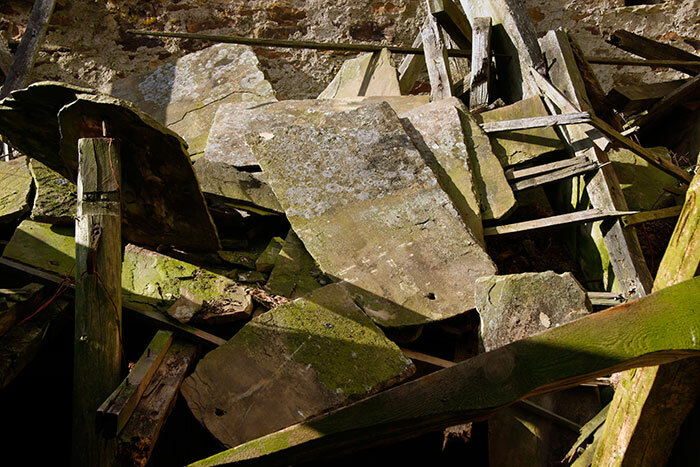 The surviving fragments of the window frame above are holding stones that seem deliberately stacked rather than contained from a collapse. 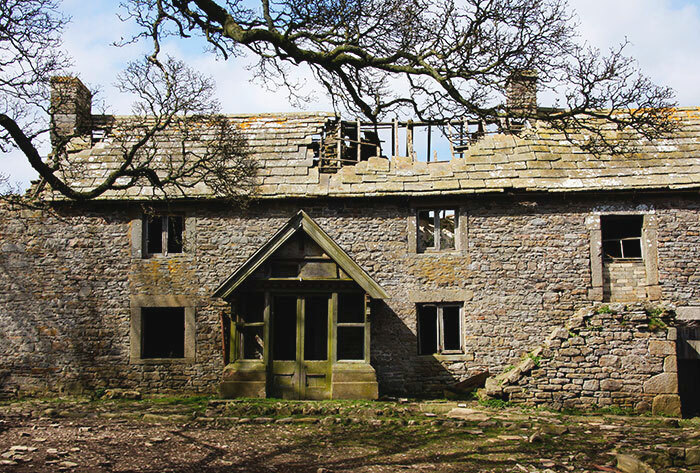 This is an attractive building with beautiful southerly views yet it stands in abandoned decay. 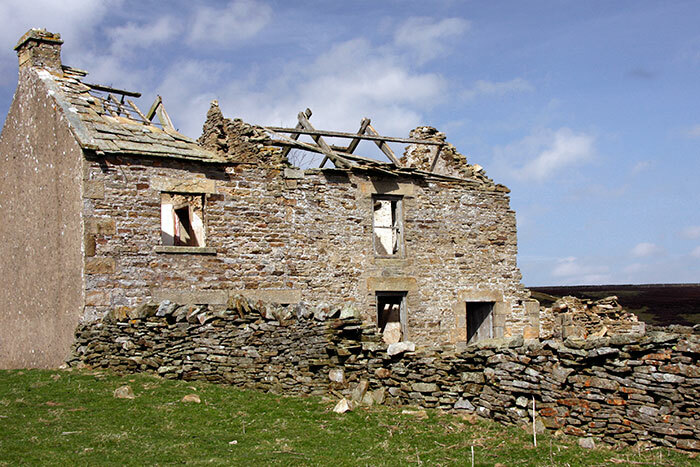 Perhaps the nearby working farm was built as a replacement or two were combined, making for building redundancy. 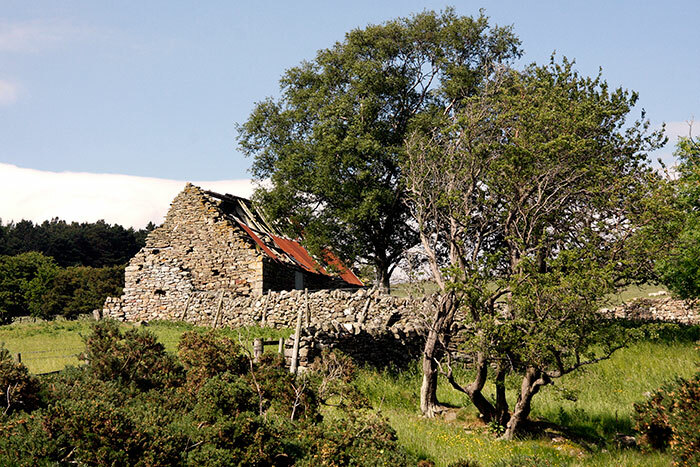 This small south facing farmstead stands unsheltered just below a landscape ridge. A large walled rectangle of fields has been won from the rough moorland slopes to the south. The nearest trees grow along the course of a stream in the narrow valley bottom way below. The land might once have been worked by people involved in the long abandoned local quarries and mines. The history and stylistic structural details of the building invite speculation. The structural details suggest a one third and two thirds division. The strong, dressed stone work casing the sash windows and doors to the centre and right contrast with the simpler and more squared formats to the left. This seeming trio of dwelling is supplemented by a central rear lean-to and a modest detached out building and store. In recent times more of similarly derelict North Pennine buildings have been renovated and sometimes extended to create new homes. This one seems too isolated to be of any such interest. I arrived at this building after a long walk and when a cup of tea and something to eat was increasingly desirable. The CORRUGATED IRON gallery suggests that I find it, at least in a state of rust, a subject of interest. Here, it adds a flash of strong colour to the crumbling stone, bleached timbers, and the changes induced by wind, rain and subsidence. Other buildings nearby are roofed in slate as this one may have originally been. A short climb on what might have once been a track brought me to the front elevation recorded in the next image. It’s a very basic structure provided with fire grate and flue to the left gable whilst three window apertures and two doorways punctuate the façade. 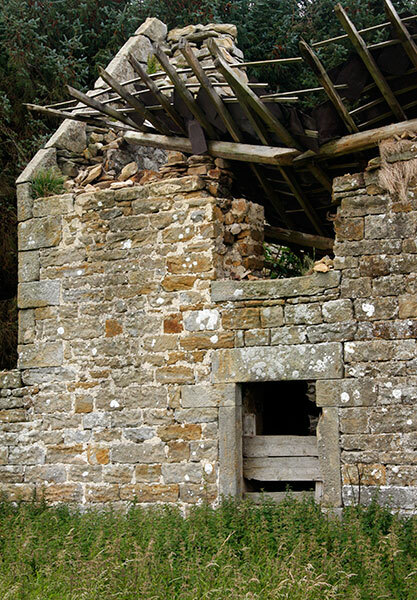 Some wooden lintels and the roughly carpentered roof beams echoed the rustic simplicity of the masonry. The gently undulating courses of stone suggest rudimentary support from little more than earth foundations. The other façade shows a blocked door with one window above and two others, very small, randomly placed. The often wild North Pennine winds will continue to remove the vividly red corrugated iron sheets. 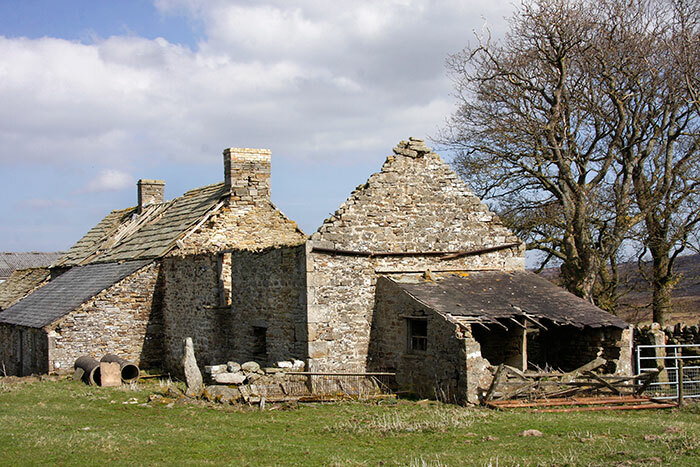 This farmstead stands on high ground without much protection from the prevailing westerly winds. A number of mature trees including these sycamores stand within its enclosing walls. 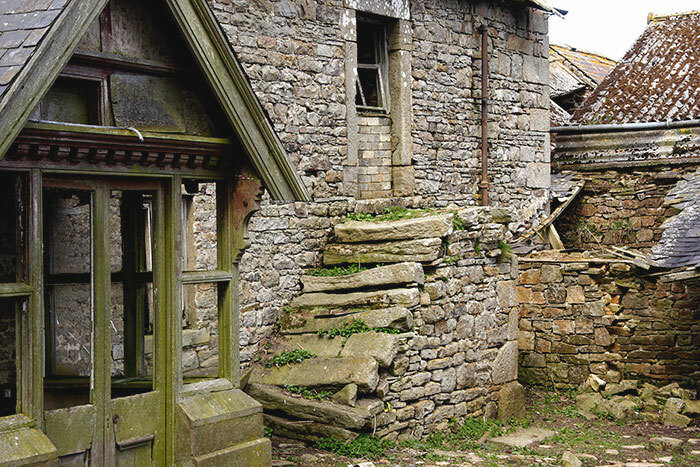 The farm house is flanked by two working wings, one with the upper floor accessed by external stone steps. The roof centre is beginning to shed its stone tiles whilst that to the left has completely collapsed into the spaces below. This is a small enclosed area shaded in season by the spreading leaf canopies. Behind the camera position are several smaller and stone flagged areas for penning small animals such as pigs or sheep. Sycamore buds were swelling and pink but even though it was early April there were few signs of the fresh green leaf growth to come. A second view by one of the entrance gateposts I shot to show the likely later wooden porch set against the house façade. 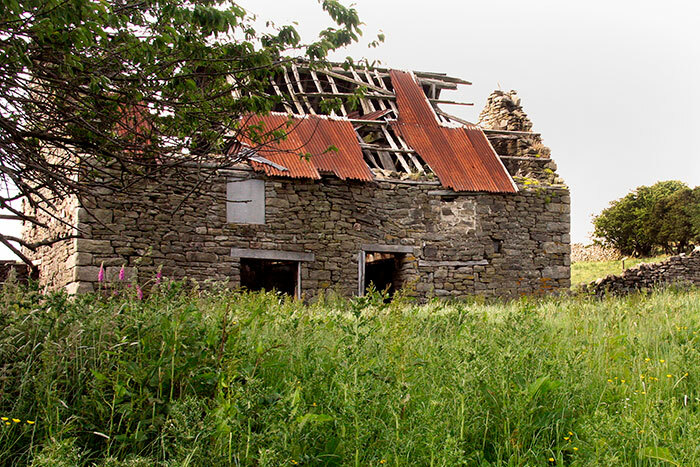 As a farm site it has a long history thought to go back to medieval times. The house seems earlier in date than the previous three. The casement windows are small, the left frame glass being hung on the centre post: they suggest the late eighteenth century perhaps? The porch contains craftsman joinery still in good order after long exposure without maintenance. Slate roofed, it must be later than the doorway it shelters. The brick core of its base is showing through a cement render and supports a dressed stone base for the woodwork. The worn stone steps to the right are sliding out of their settings. 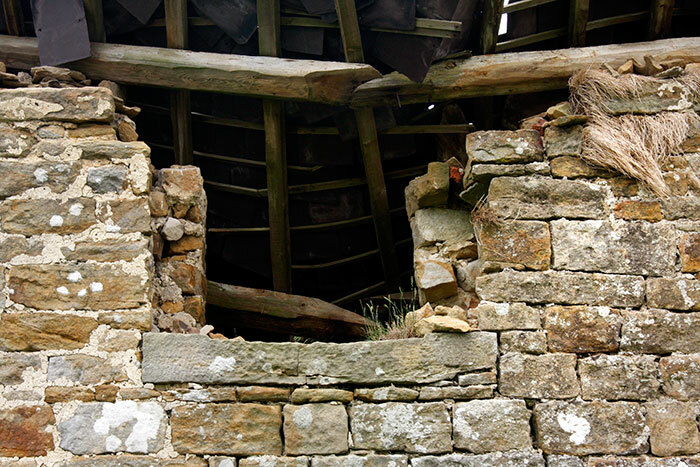 The wood rafters and stone slabs from this two storey working extension to the farmhouse lie collapsed within its walls. 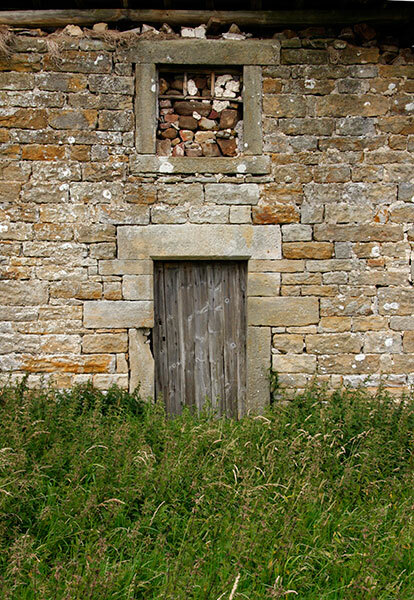 Substantial stone slabs frame the doorway. 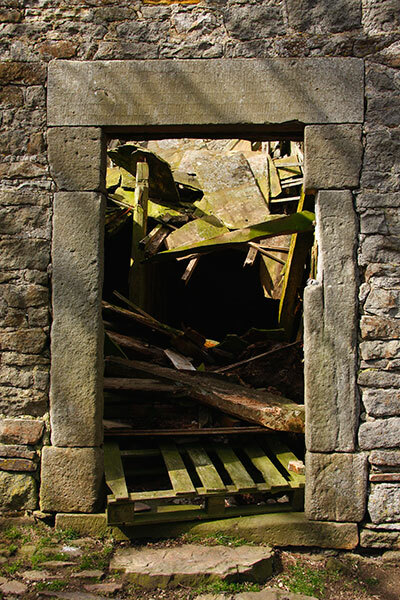 A closer view of the stone and timber debris tumbled within the outbuilding. Each stone roofing slab would have been fixed to the roof timbers by a single hardwood peg. 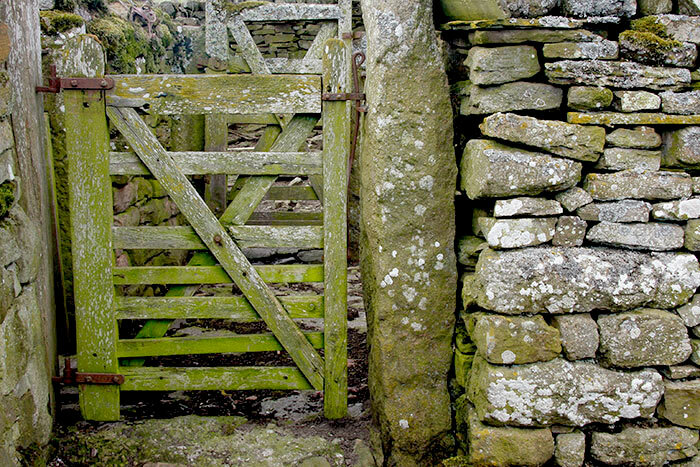 Several small interlinked and stone-flagged animal pens occupied an area of ground offset from the farmhouse. Wooden gates hinged and fastened by ironwork from the local blacksmith were hung on tall stone slabs. The small enclosures and narrow passageways suggest enclosure for sheep rather than cattle. This broader perspective from the west show the farmstead set on ground rising gently to the north. The mature trees break up the prevailing winds around the buildings but there are none to provide a more detached and extensive shelter. It’s in a very remote setting that’s beautiful on a fine day. 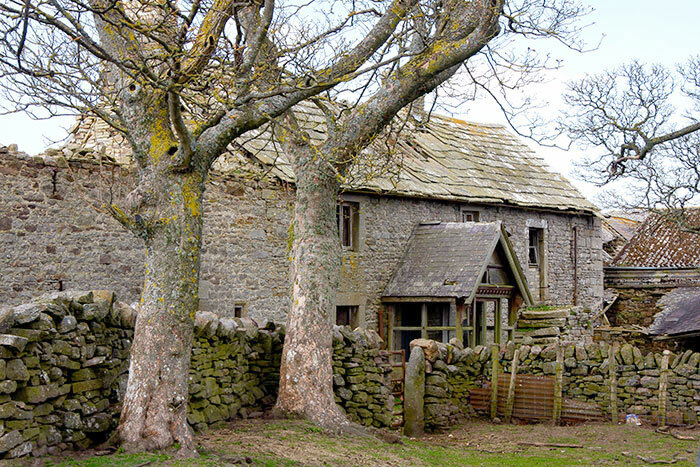 In winter and without modern facilities it must have been a tough environment in which to live and work: our rural ancestors were a tougher breed.